Gisela in Her Bathtub, (1991) a comic one-act opera by Neil Weisensel and Michael Cavanagh, and A Hand of Bridge, (1959) by renowned American composer Samuel Barber. In Gisela in Her Bathtub, Gisela is reading the final chapter of a romance novel while lounging in her bathtub. The characters she reads about come to live via the operatic singers. This short piece is full of operatic clichés, puns, and gags. Also, who can resist coming to see an opera that features a gorgeous naked woman in a bathtub? A Hand of Bridge gives a slice of life insight into the lives of four unhappily married people who are playing a game of bridge. Each character reveals their innermost selves through emotional, interesting, and jazz-infused ariettas. Mezzo-sopranos Kay White and Elizabeth Evans will also present highlights from Barber’s eclectic song repertoire. The 9th Ward Opera Company was founded in 2012 by Dr. Kathleen Westfall. Its mission is to give local opera singers the opportunity to develop their craft and gain performance experience while also exposing locals to entertaining and accessible classical music. 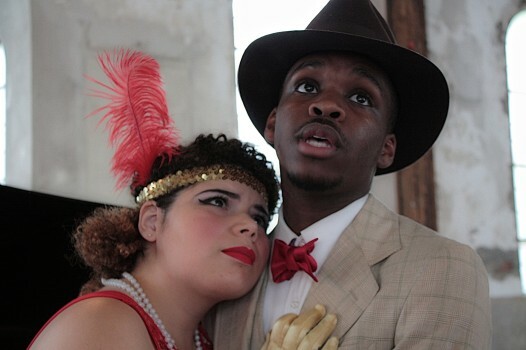 Last summer the group presented an acclaimed production of the comic opera An Embarrassing Position, by local composer Dan Shore and a tragedy Blue Monday, by Gershwin. 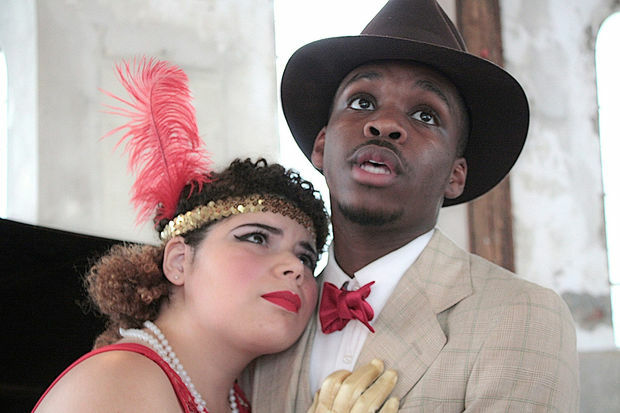 This summer marks The 9th Ward Opera Company’s third year of performances in New Orleans. Tickets: $20; $10 Students/Seniors; purchase tickets on line www.marignyoperahouse.org or at the door (first come first serve). This production is made possible through the generosity of the New Orleans Jazz and Heritage Foundation. Artist: 9th Ward Opera Co.
With a rarely staged early work by George Gershwin and a charming contemporary piece, the 9th Ward Opera Company swings into summer, taking audiences on a bright journey into the Jazz Age.The year-old troupe of young singers, under the artistic direction of Kathleen Westfall, brought a brisk vitality to the Marigny Opera House with the two brief works – “Blue Monday,” Gershwin’s first explorations into an operatic form, and “An Embarrassing Position,” a new work by local composer Dan Shore, based on a story by Kate Chopin. effective as Sam, singing the resonant commentary on the action; Vickie Thomas was an imposing May, who runs the speakeasy. 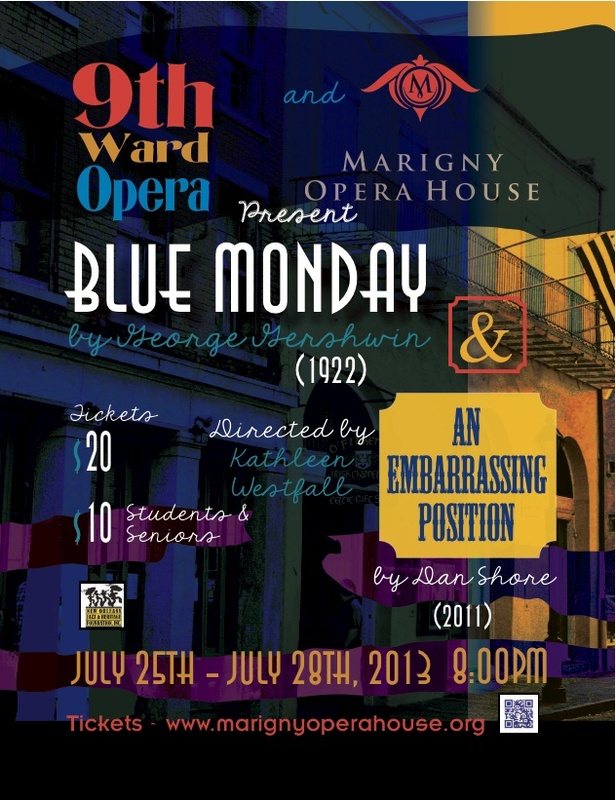 What: The 9th Ward Opera Company, under the direction of Kathleen Westfall, presents a pair of one-act operas, George Gershwin’s “Blue Monday,” and Dan Shore’s “An Embarrassing Position.” The operas are directed respectively by Margaret-Anne Davis and Danielle Edinburgh. Madeline Thibodeaux conducts; pianist Ronald Joseph is the accompanist. Where: Marigny Opera House, (site of the former Holy Trinity Church),725 St. Ferdinand St. When: Performances at 8 Friday through Sunday, through July 28. Admission: $20, $10 for students and seniors. For information, call 504.948.9998 or visit the theater Web site. For the second summer in a row the Marigny Opera House is offering itself as a performance venue to a homegrown small opera company. The 9th Ward Opera Company is the brainchild of Kathleen Westfall, a self-described “little Cajun girl” who’s equally comfortable singing on stage in New York or going crabbing in Thibodaux. Sharon Litwin talks to her about the two unusual one-act operas she’s presenting this month. To read more about the 9th Ward Opera Company and its upcoming performances at the Marigny Opera House, visit Sharon Litwin’s article on NolaVie. click to enlarge Photo by Cheryl GerberThe 9th Ward Opera presents Blue Monday at Marigny Opera House. Thirteen years before George Gershwin’s opera Porgy and Bess debuted on Broadway (in 1935), his one-act jazz opera Blue Monday (Opera a la Afro-American)opened and promptly closed. It calls for an all African-American cast (the debut featured white actors in blackface), and it’s a remarkable if forgotten work. 9th Ward Opera Company founder and director Kathleen Westfall says it’s just right for her young company, and it’s part of a double bill opening at the Marigny Opera House Thursday. Blue Monday is set in a Jazz Age Harlem bar where pianists entertain and patrons gamble in the back room. Vi is in love with Joe, a chronic gambler, and the piano player Tom tries to woo her away from him by planting suspicions about other women. The work suits the 9th Ward Opera’s goals of exposing audiences to short, entertaining operatic works and providing young singers the chance to perform. She chooses works in which many characters have solos. Westfall teaches at the University of New Orleans (UNO), where she was first exposed to opera as a freshman in a music history class. She created the 9th Ward Opera last summer to present two one-act operas, Cox and Box andTrial By Jury. The show was scheduled to run at Marigny Opera House, but its lack of appropriate permits (since remedied) resulted in the program being moved to the AllWays Lounge and Theatre. The run was well-received, and Westfall committed to doing a 2013 performance of An Embarrassing Position, a one-act opera by Xavier University professor Dan Shore, who also created the new opera Freedom Ride. Westfall received a New Orleans Jazz and Heritage Foundation grant specifically to do Shore’s work, and it’s the second part of the double bill. Marigny Opera House founder Dave Hurlbert encouraged her to schedule performances throughout the year. He provided the company some financial support for the first show, and together, they presented The Liebeslieder Project in December 2012 and a pair of one-act operas in April. Marigny Opera House has become a home for opera, dance, New Orleans Fringe Festival shows, puppetry and more. The new opera company New Fangled Opera presented a series of new operatic works at UNO in June. It will present a series of one-acts at Marigny Opera House in June 2014. Part of its mission is to present works by contemporary composers. More than 100 projects were submitted for inclusion in the program, and productions included singers from Philadelphia and Kansas. The scarcity of roles for young opera singers compels many to invest in travelling to get exposure, New Fangled Opera cofounder Chris D. Burton says. Hurlbert has provided support and art grants via the Marigny Opera House foundation, and he’s continued to renovate and improve the space. He recently added heavy pleated curtains to the backstage and wings, which improved the converted church’s acoustics. While Marigny Opera House is a large space, the 9th Ward Opera’s shows are designed to avoid the costs of productions like those presented by the New Orleans Opera Association (NOOA) at the Mahalia Jackson Theater for the Performing Arts. Westfall uses piano accompaniment instead of a full orchestra, and costume and prop expenses are modest. But the smaller companies don’t see their productions as an alternative to full-scale productions, but rather a bridge to them. Givonna Joseph has performed in NOOA productions, including several shows last year, and she will appear in two in the upcoming season. She created Opera Creole in 2011 for two reasons: to expose more New Orleanians to opera and to educate audiences about African-Americans in classical music. 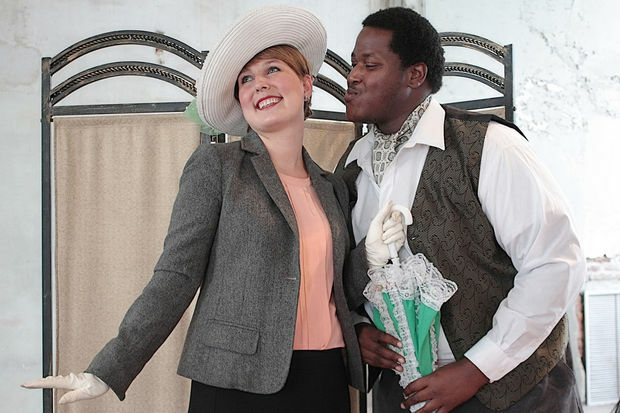 Nearly a year ago, classical vocalist and adjunct UNO professor Kathleen Westfall debuted the 9th Ward Opera Company, holding public performances of Burnand and Sullivan’s Cox and Boxand Gilbert and Sullivan’s Trial by Jury for three nights in the first week of August. Conceived as an outlet for aspiring theatrical vocalists across the region, the enthusiastic turnout at the company’s initial showing prompted its founder to further pursue its mission. Since, the 9th Ward Opera Company has upheld a seasonal schedule, delivering two performances of a single act opera per night with each run and growing steadily along the way. All Rights Reserved. © 2013 Kathleen Westfall.